If there’s one problem I’ve consistently heard over and over again from family, friends and coworkers, it’s that they feel tired and zapped of their energy throughout the day. It's like they can’t stop yawning, and accomplishing any kind of task can seem like it takes three times the effort it should. If you’re one of the many, millions of people out there who suffer from some serious daytime fatigue, this blog is for you! Of course, getting enough sleep the night before is a big part of not feeling tired the next day, but it’s not the only part. We’ve got 8, simple ways that you can combat daytime fatigue and have more energy through the day. Did you know one of the number one causes of daytime headaches is actually dehydration?! Being dehydrated can not only cause headaches, but can also leave you feeling lethargic and unmotivated. So, start your morning with a big class of water and keep it going throughout the day! A lot of you aren’t going to like this one, but caffeine, while providing an initial energy boost, can leave us feeling even more fatigued later in the day (especially if that caffeine is filled with fatty milk and lots of sugar!). Caffeine also dehydrates your body, but, if you can’t give up that cup of Joe, at least make sure it’s free of sugar and that you’re drinking even more water to compensate. It’s no surprise that we’re a big proponent of exercise here at Faithful Workouts. Getting up and moving our body and starting your day with a workout really can make all the difference! 30 minutes a day is recommended to reap all the health benefits of exercise, but even fifteen minutes over your lunch break can do wonders for your energy levels. Join us for a FREE Rejuvenating 13 Minute Work to help get your body moving and your blood flowing! If you’re starting your day off with a giant pastry and huge coffee…it’s not going to bode well for you later. We’ve all had the feeling of going out to a big lunch and then having to come back to the office when all you really want to do is nap. To avoid the mid-afternoon crash, avoid high fat, high carb/sugar breakfasts and lunches, and make sure you’re getting your protein in. Try snacking more often throughout the day with things like almonds, apples, turkey roll-ups, berries, organic beef jerky, etc. Looking for some easy healthy breakfast recipes? Join us over at The Fresh Table for lots of yummy options! Nothing gives me energy like saying a quick prayer, or listening to some uplifting music. God says we can do ALL things through Christ who strengthens us, so pray for energy and strength throughout your day. It sounds silly, but a good laugh really can change the whole direction of your day. Whether it’s taking five minutes to talk to a close (and funny) friend, or reading a few jokes over your morning coffee or lunch break - take a second to laugh. This is especially important if you work at a desk and are sitting in one position all day. Take a second to jog up and down the stairs once, or even just making it a habit to stand and stretch every 30 minutes—whatever works for you. This one might sound strange, but the fact of the matter is—routine, while helpful, can also make us entrap and enslave us. The same thing everyday? It’s enough to make anyone feel bored and tired. So change up your routine! Invite someone to lunch, ask someone if you can pray for them, whatever it it, challenge yourself to get out of your desk and out of your comfort zone! Was this post helpful? Be sure to leave me a comment, would love to hear your thoughts. Be sure to also join us over on our Faithful Workouts Facebook page where you can find more tips, inspiration and community conversation. Michelle is the founder of Faithful Workouts and The Fresh Table. 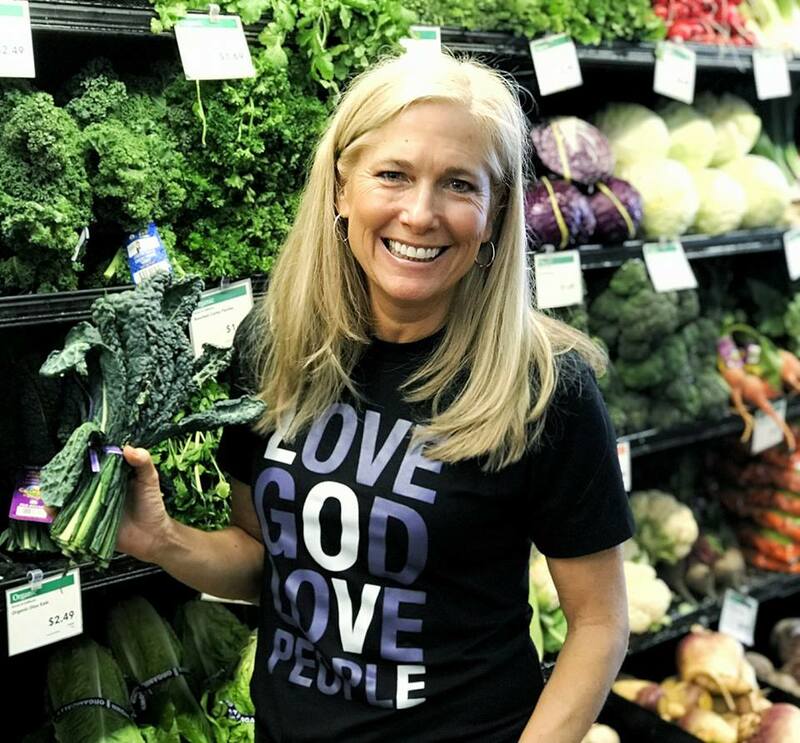 She began her fitness career in 1984 and still loves to help people break free from fitness frustration and move towards a life that's full of physical and spiritual health. Michelle is married to Jeff and they have three children and a lovable dog named Mojo. The fastest soup you'll ever make!